In December, I openly wondered on the blog and in my Footballguys Insider column whether there was something more to Adrian Peterson’s abdominal injury than was being reported. I’m anxiously awaiting more specifics on Adrian Peterson’s abdominal injury. It’s something he’s played through for multiple weeks now, which usually hints at an injury that is not significant. However, there are relatively few injuries involving the abdominal area and some of them – abdominal muscle tears (a.k.a. sports hernia), oblique muscle strains, among others – are very difficult to play with effectively. If Peterson breaks the rushing record and takes his team to the playoffs while playing through one of those injuries, it’s another story to add to his legend. 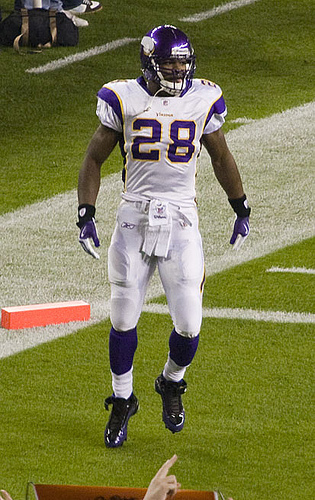 Peterson’s abdominal issues were first reported in mid-December. Over the final four weeks of his season, including the last three weeks of the regular season and the Vikings’ playoff game, Peterson carried the ball 104 times for 596 yards, a 5.7 ypc average. I would argue that’s as impressive as his well-chronicled recovery from the ACL, LCL and meniscus injury he suffered in December, 2011. Sports hernia and core abdominal muscle injury are generic terms for many different kinds of abdominal and pelvic injuries. The website of Dr. William Meyers, an expert on these injuries and the surgeon who performed Peterson’s repair, reports as many as 121 combinations of injury to the structures in the region. Many of these injuries are overuse injuries of sorts, and are related to the stress of the repeated, abrupt movements a player makes. In Peterson’s case, it’s highly likely his injury was related to the sudden, explosive changes of direction he makes while running the football. And it’s almost certain that, after the injury, any of those explosive changes of direction would have caused pain and complicated by some weakness in the muscles and structures that were injured. Peterson’s return to elite play is freakishly impressive. The elephant in the locker room, of course, is whether Adrian Peterson’s superhuman season was assisted by performance enhancing drugs. I’m not aware of a PED that would counter the pain and weakness caused by a torn abdominal muscle, so I think it’s less relevant to this discussion than his recovery from reconstructive knee surgery. Meyers’ website reports that most of his surgical patients return to their prior activity levels in 3-8 weeks. That’s consistent with what we’ve seen from his NFL patients. Expect to see Peterson ready to further advance his legend well in advance of training camp.